Spinach Salad with Warm Bacon Dressing and hard boiled eggs is a classic favorite and perfect for entertaining or to compliment a family meal. This spinach salad is simple to make and wins over everyone–even people who THINK they don’t like spinach! This classic Spinach Salad with Bacon made with hard boiled eggs is rich in flavor, so it is best paired with dishes that can stand up to that bold flavor, such as New York Strip Roast, Tuscan Pasta with White Beans and Tomatoes, or Slow Cooker Pot Roast. If you are looking for a more mild spinach salad, check out my Strawberry Spinach Salad. I remember the first time I had a Spinach and Bacon salad with warm dressing. I was helping out at a birthday party for a family I nannied for in college. The mom had given me the instructions for a warm bacon dressing to be tossed with spinach and hard-boiled eggs. Hmm…that made me a bit nervous. I was afraid that the dressing would be too greasy or too salty. I really wasn’t sure. However, I was blown away by this delicious combination of spinach and warm bacon dressing and it has since become a favorite salad of mine. This Spinach Salad has everything! Crispy bacon adds crunch and flavor to this spinach salad. The hard boiled eggs add a creaminess to the salad, while the red onions give the salad a bit of bite and sharpness. And finally the warm bacon dressing brings a dimension of flavor with it’s sweet and salty notes. If you THINK you do not like spinach, I am willing to bet you will enjoy this salad with bacon dressing. Crispy, crunchy, salty, creamy, and hearty–all in one simple salad. Place 5 slices of bacon in the pan and pan fry for 3-4 minutes per side, or until bacon is crispy. Remove bacon from frying pan and place on paper towel lined plate. Reserve 1 tablespoon bacon grease. While the bacon grease is still warm, add in mustard, apple cider vinegar, maple syrup and pepper and whisk well. Taste and season with additional salt if needed. Serve immediately over spinach salad. **It is important to use warm bacon grease, as bacon grease will solidify as it cools. Crumble bacon when cool enough to handle. Toss spinach with cooked bacon, onions, hard boiled eggs, and dressing. Serve immediately. I love adding red onions for crunch and flavor to this spinach salad. But I suggest you soak the red onion slices in cold water for 5-10 minutes to help tone down their flavor. I do this while cooking the bacon for the salad. It is traditional to pair this salad with sliced button mushrooms. Feel free to do so. I personally do not care for the texture or flavor of plain button mushrooms. This salad is best served immediately after preparing. 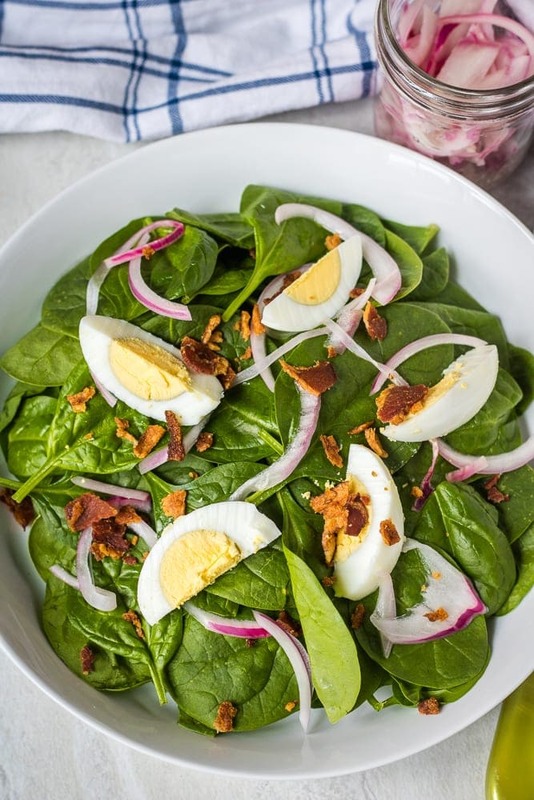 If you would like to prepare this Spinach Salad with Bacon ahead of time, prepare bacon, reserve grease, soak onions, and make hard boiled eggs up to 3 days in advance. When ready to serve, warm reserved bacon grease and prepare salad dressing then serve immediately. 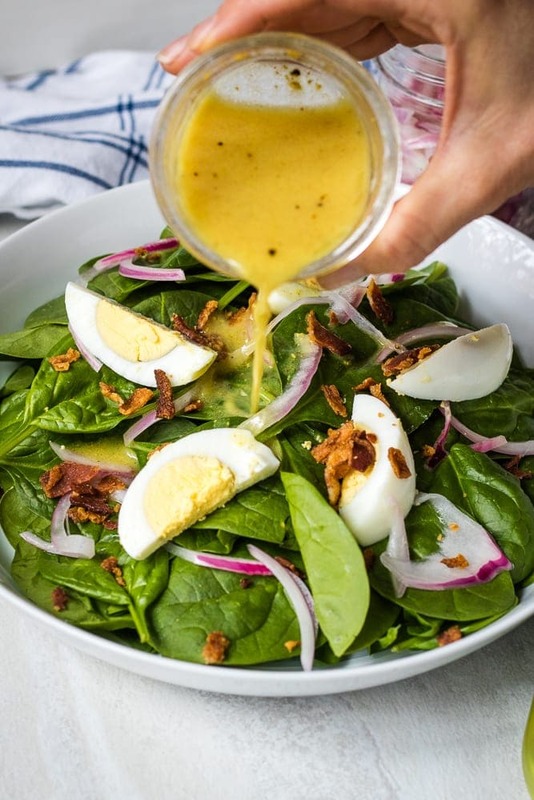 Spinach Salad with Warm Bacon Dressing and hard boiled eggs is a classic favorite and perfect for entertaining or to compliment a family meal. This spinach salad is simple to make and wins over everyone--even people who THINK they don't like spinach! In a small bowl, add sliced red onion, cover with cold water and allow to soak while the remainder of the salad is being prepared. Heat a medium frying pan over medium heat. Place the bacon in the pan and pan fry for 3-4 minutes per side, or until bacon is crispy. Remove bacon from frying pan and place on paper towel lined plate. Reserve 1 tablespoon bacon grease. Crumble bacon when cool enough to handle. Drain off water from red onions. Whisk together bacon grease, vinegar, mustard maple syrup and pepper together. Taste and add salt if needed. Immediately serve with prepare salad. Very nice salad. Love Spinach so much and this will be delightful when it gets hotter here in AZ. One of my favorite salads as a side dish or all on its own. Love the details for making the bacon dressing! Thank you.